Give your Sweetie Pie... A Sweetie Pie! Fill your pie with your favorite small candy, like small Jelly Beans or cinnamon hearts. A great gift for that someone special! 1. Make sure your 3 muffin cups are stacked inside each other (one cup is not sturdy enough to hold the felt and candy). Cut about ½" from around the top of your muffin cups. 2. Cut out the printed template and trace it onto a piece of light brown felt. 3. Cut out the pie shape from the felt. The easiest way to cut out the ovals around the pie is to fold the felt slightly, make a slit, and then cut out each oval. 4. Fill a baggie with ⅓ cup of Jelly Beans or other small candy. Secure with a twist tie. 5. Place your baggie in the middle of the felt circle. If you traced with marker/pen make sure this side is facing up and make sure the twist tie is facing up as well (when you turn it around it will all be hidden underneath). 6. Wrap felt around the candy and secure at the top by wrapping around a rubber band or some string. 7. Turn your pie over and place it into the muffin cups. If you want you can put some glue inside the muffin cups to secure the pie inside it's shell. 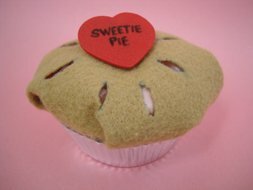 Cut out a small heart from paper or craft foam; write "Sweetie Pie" on the paper and glue it to the top of the pie. You could also place the finished pie into a baggie and tie on a cute gift ribbon and gift tag!